1821: What Made It Greek and Revolutionary? 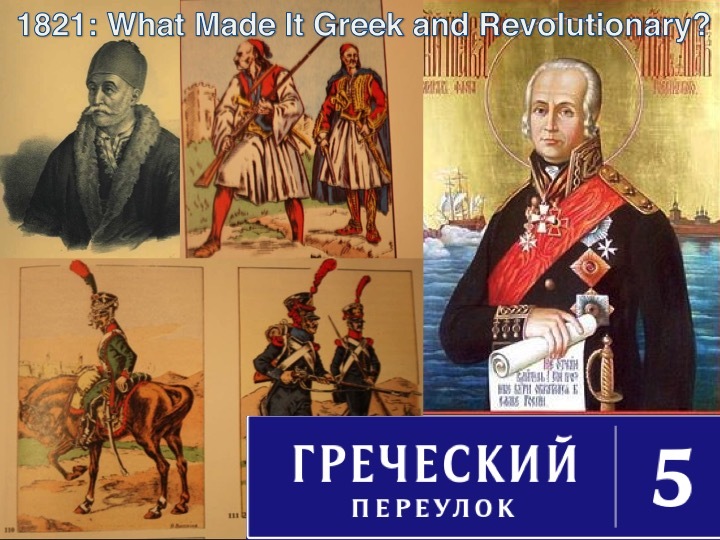 Please join us on Friday, October 20th for a conference entitled “1821: What Made It Greek and Revolutionary?”, hosted by the NYU Jordan Center for the Advanced Study of Russia with support by the Global Research Initiatives, Office of the Provost and co-sponsored by The A.S. Onassis Program in Hellenic Studies at New York University. Since there was no formal “Greece” in 1821 but many people who claimed to be Greek on one or another basis, we will do well to consider the Greek Revolution in less determined and teleological ways. Greeks inhabited empires (Ottoman, Russian, Venetian, French, and British) which afforded them enormous mobility and opportunity as well as more familiar limits. Rather than look at the absence of a state as a limit, and rather than assume that the extreme southern Balkan peninsula was its core, we explore the ways in which Greeks could be just about anywhere, with upward and lateral mobilities and multiple ways to represent themselves and multiple imperial powers to which they could appeal. By the time of the conjuncture of 1821, the Greek world was at its most expansive as many Greeks cashed in their transimperial presence for the stability and legitimacy of a nation-state.